After almost four weeks of being stumped about blog-worthy topics, I’m back with a HUGE announcement. It’s curtains for the year 2012! I know, big news, isn’t it? It seems like just a few minutes ago when we were ushering in the year, 2012, with fireworks, countdowns, ecstatic and hopeful praise sessions in church services and belting out drunken renditions of ‘Auld Lang Syne’ while holding hands with perfect strangers. Where did all that time go? How did approximately 12 months, 52 weeks, 366 days, 8,765 hours and 31,556,736 seconds pass so quickly? But even more importantly, what did we do in that time? Did we manage to accomplish the goals we set ourselves? Did those resolutions become revolutions? Were those promises kept? Were the commitments made maintained? These, and many more, are the questions that plague us as the 31st day of December creeps up each year. For me, the answers to the questions would be two-sided. Yes and no. On the one hand, I did accomplish some of the goals I set myself, on the other, I didn’t quite hit the mark. But that’s ok. I’m not beating myself up for not scoring 100%. Life is too short to dwell on regrets and could-have-beens. When I was a child, my parents would buy me school supplies and stationery including new ruled exercise books at the start of the school year. 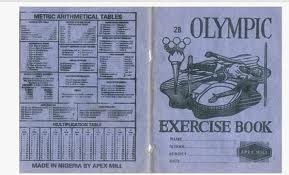 I loved those exercise books. I couldn’t wait for school to resume so I could write in them. The blank pages held such promise. My own thoughts and interpretation of what I would learn from my teachers. In my own handwriting! Oh, the endless possibilities of all that I could write in them! I like to think that my life is like one of those new exercise books and the new year, a blank page in it. A chance to start afresh, to write out and bring to life all the possibilities that my life holds; To have another go at doing the stuff I feel I should be doing and becoming the person I’m meant to be; Of making mistakes and leaving dark smudges on the page as I try to rub them out and do them over. And I’m just as excited as I used to be all those years ago. As 2012 draws to a close, I think it is only fitting for me to say a big thank you to everyone who has stopped by to read this blog, commented on/liked the posts and subscribed. You make it such a worthwhile venture. I am grateful for your constant support and your presence in my e-life. I don’t know what 2013 holds for me but I know the One who holds 2013 in the palm of His hand. I’m choosing to put my hand in His and let Him guide me through it. I hope that this time next year, we will be here together to recount the wonderful blessings with which our lives will be filled in the coming year. Though tears come, may they be few. And help in your time of need.